The New Zealand Ministry for the Environment (MfE) has released a summary of submissions on its discussion paper on the prioritisation of waste streams for product stewardship intervention. Stakeholders generally agreed with the MfE’s criteria for prioritisation but suggested weighting ‘risk of harm’ and ‘resource efficiency’ higher than other criteria. Stakeholders also generally agreed with the MfE’s proposed priority products (electronic and electrical equipment; tyres; agrichemicals and farm plastics; and refrigerants and other synthetic greenhouse gases), but recommended adding packaging and plastic bags for prioritisation. 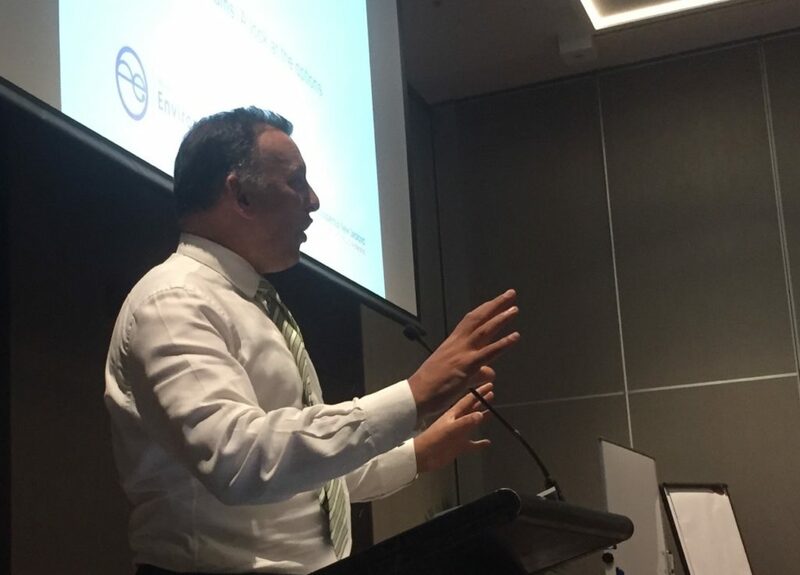 Mike Mendonca of the MfE (pictured below) announced the summary’s release and reviewed its findings during the recent WasteMINZ Roundup in Auckland, which emphasised product stewardship. In a session with Mike and WasteMINZ Board Chair Darren Patterson, GlobalPSC CEO Russ Martin outlined overseas developments in product stewardship and their implications for New Zealand. GlobalPSC Advisory Group members Helen Lewis of Helen Lewis Research and John Gertsakis of Infoactiv were also active participants in the Roundup discussions, as was Paul-Antoine Bontinck of the Vinyl Council of Australia. Public consultations on priority products opened in May 2014. The GlobalPSC submission developed in conjunction with our Advisory Group is available to GlobalPSC members via our Knowledge Base, under the Frameworks and Harmonisation heading.